"Gérald Cramer et ses artistes. Chagall, Miró, Moore"
Installation view: “Gérald Cramer et ses artistes. Chagall, Miró, Moore,” Cabinet d’arts graphiques du Musée d’art et Histoire, Geneva, 2016–2017. 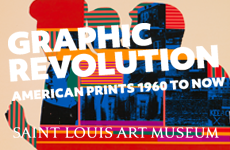 This valuable exhibition celebrates the art of the print publisher, here in the person of Gérald Cramer, who over a period of 40 years worked with many of the major figures of European modern art. Beginning as a bookseller in Geneva in the 1930s, Cramer developed into one of Europe’s most important publishers of artists’ books, prints and other editions. Condensing this singular career through an inspired selection of objects, curator Christian Rümelin has chosen to focus on his activities with three artists—Marc Chagall, Joan Miró and Henry Moore—each of whom worked with Cramer in distinctly different ways to produce works that are among the best of their careers. Though the bulk of the exhibition is devoted to Chagall, Miró and Moore, the opening room places Cramer among a broader swath of modern masters. All the works on view here—a beautiful, intense blue watercolor by Georges Braque, drawings by Picasso, a richly colored work on paper by Miró—are personally dedicated to Cramer, testimony to friendships that went far beyond business. Underlining this is a portfolio celebrating 30 years of his publishing that includes work by Chagall, Moore, Picasso, Max Ernst and Marino Marini. Alexander Calder designed the clasp for the wooden folio in the shape of the letters G and C.
Joan Miró, pages 10 and 11 from À toute épreuve (1958), color woodcut and typography, 32.2 x 50.4 cm. Cabinet d’arts graphiques des MAH, Genève. ©Successió Miró / 2016, ProLitteris, Zurich. Each of the next three rooms is devoted in turn to the three artists of the title. 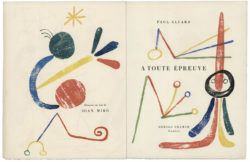 Miró’s book with the poet Paul Eluard, À toute épreuve (1958), is a fine example of the grand livre d’artiste tradition, demonstrating a commitment to the collaborative process without compromise. Eleven years in the making, published by Cramer and printed by Jacques Frelaut, the book brings together text and image so that each double-page spread can be seen as an independent composition. Throughout the book, subtle changes in the size and spacing of the type respond to the openness of Miró’s floating areas of woodblock color. The exhibition includes a number of the blocks themselves, which are something of a revelation: the artist’s motifs, cut from small pieces of wood, were glued to a master block to ensure accurate registration—a simple and basic technology giving rise to astonishing lightness and rhythm. Henry Moore, Bones have marvellous structural strength and hard tenseness of form, plate 10 from Elephant Skull (1970), etching, image 25.2 x 19.8 cm, sheet 49.3 x 36.7 cm. Cabinet d’arts graphiques des MAH, dépôt de la Fondation Gérald Cramer, Genève. Photo: A. Longchamp. ©The Henry Moore Foundation, All Rights Reserved, http://www.henry-moore.org / 2016, ProLitteris, Zurich. A very different approach is manifest in Chagall’s Poèmes (1968). Written by the artist in Russian and Yiddish, then translated into French and rephrased by Philippe Jacottet, the poems appear on the left-hand side of the spreads, opposite full-page color woodcuts. Chromatically and emotionally intense, the prints exhibit the fluidity and atmospheric qualities more associated with lithography than with woodcut. On close inspection, it is clear that in addition to the master block containing the drawing, multiple blocks of broken color were used to build these compelling images. In the center of this room, Chagall’s folded screen, Pavevent (1963), stands alongside a screen made some 75 years earlier by Pierre Bonnard, Promenade des mourrices et une frise des fiacres (1897), showing how both artists employed lithography to create rich overlapping color. Completing the room, a wall of monotypes demonstrates what a natural graphic artist Chagall was. 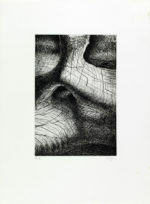 Having seen some Degas monotypes belonging to Cramer in 1958, he followed the publisher’s suggestion to take up the process. He seemed to revel in its mark-making possibilities, from lines inscribed through the ink to color applied with his fingers. 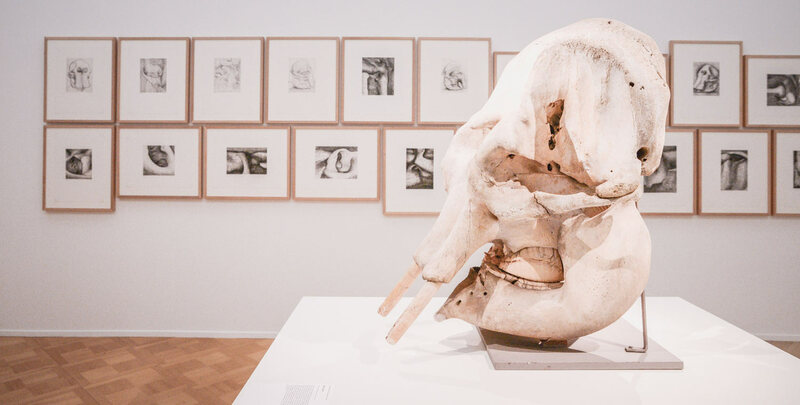 In contrast to the color-saturated rooms of Miró and Chagall, the final gallery centers on Moore’s black-and-white portfolio, The Elephant Skull (1970), a series of etchings the sculptor made of a skull he received as a gift from Sir John Huxley in 1968. Following discussions with Cramer, the object became the subject matter for what I consider to be Moore’s greatest graphic achievement. The portfolio takes the narrative structure of a book, leading the viewer on an immersive journey that moves from images that take in the skull as a whole, to details in which its biomorphic forms suggest landscapes and even the artist’s “shelter drawings” of people sleeping in the London Underground during the Blitz of London in 1940. The skull enabled Moore to work objectively from the source, while also releasing his imagination. Throughout the folio there is a clear sense of the awe that Moore must have felt in its monumental presence. Keeping company with the portfolio in the gallery is the skull of Mademoiselle D’Jeck, a celebrated theatrical elephant who became aggressive and was shot dead in Geneva in 1837. Set against Moore’s etchings, her skull, on loan from the Muséum d’Histoire Naturelle, offered a startling demonstration of the way art can project ideas and interpretations onto inanimate objects. 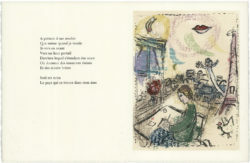 Marc Chagall, Poèmes: Seul est mien, Gravure XII (1968), color woodcut and typography, image 32.3 25 cm, sheet 37 x 57 cm. Cabinet d’arts graphiques des MAH, dépôt de la Fondation Gérald Cramer, Genève. Chagall® / ©2016, ProLitteris, Zurich. The complete Elephant Skull portfolio includes an essay by the critic Henry J. Seldis and folded covers for each etching that bear a comment or title by Moore. These are not shown, undoubtedly due to lack of space, though the titles are included in the wall text. 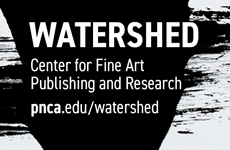 When seen alongside the etchings, however, these texts provide added insight into both the deference with which Moore was held and the poetic, reverential language that was used in describing art practice at that time. The prints, nonetheless, are powerful enough to stand on their own, demonstrating Moore’s incisive line and testifying to the printing skills of Frelaut. The exhibition concludes with Moore’s Sheep portfolio (1975), a marked contrast to the earthy structure of the elephant skull prints. Again using etching, the sculptor observed the sheep seen from his studio window over a course of a year. Here Moore’s recurring theme of mother and child becomes touchingly transposed into ewes and their lambs within the English landscape.